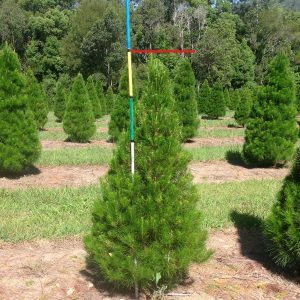 Coramba Farms grow and sell real Christmas trees, right here on the north coast of New South Wales. From humble beginnings, the farm now has more than 6000 trees on 125 acres of land, and supplies distributors from the Gold Coast through to Port Macquarie. Each tree takes up to three years to grow, and all are expertly pruned during that time to ensure they maintain their traditional, Christmas tree look. Our Farm at Coramba is an easy 15 minute drive west of Coffs Harbour. 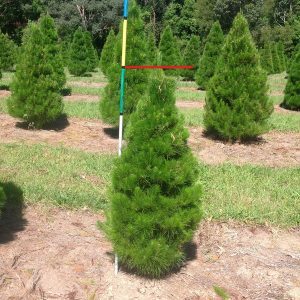 Come out and explore the plantation, pick out your tree from our four different sizes (small through extra-large), and we'll cut it for you then and there. We can even net it for you to ensure it stays neat and tidy (for your car) and free from accidental branch breakages. Many of our return customers say picking their own tree to order marks the start of their Christmas fun. You may wish to come out to the farm when the paddock first opens to select and tag a tree for pickup closer to Christmas. Keep an eye out on our Facebook page for when these times will be. All pickups for Coffs Harbour should be collected by 10am. All Pickup Locations are listed below with a purchase link to our shop now page if online purchasing is available. Phone orders are highly recommended. The detailed maps below outline these location with relevant contact number for phone ordering. Please let us know your estimated pickup time when ordering. Deliveries (Coffs Harbour only) Sunday mornings only. Ordered trees to be picked up before 10 am. In store or online, trees available 6, 13 and 20 December. Ground FX Landscaping Supplies, 15 John Fraser Pl, Port Macquarie. On arrival we were greeted by the lovely staff and made to feel very welcome. We took our time exploring to find the ideal tree and didn't have to wait long at all before our tree was cut down and bagged up. A great experience and I look forward to doing it again next year. Highly recommended. Absolutely fabulous service and such a lovely tradition to start with our young kids. The trees are magnificent and are well looked after. Amazing experience. We had a great time picking out our first ever real christmas tree. The staff were very helpful and full of knowledge. We'll definitely be going back next year! So much fun to pick a tree with the kids and they smell amazing! The staff are lovely and very helpful. Thank you for providing beautiful Christmas trees every year. A family tradition we have been able to continue since moving to Coffs 5 years ago. Will be back next year!! Love getting our real tree , the kids have a ball and its become a family tradition ! The smell of the tree throughout the house ..the whole experience is amazing. Highly recommend, great service, it was a memorable family moment. This is our fifth year getting one of your trees. Our house smells amazing. Great trees, really good experience to go and pick out your own! Fills our lounge room with that real pine smell and makes the real Christmas atmosphere. We love our tree, our new family tradition. Thank you so much. Beautiful Christmas pines. Lovely thick foliage and they smell amazing. We had the best time hand picking our special tree. We had so much fun picking a tree!! Will be back next year! Traditional, all natural, real Christmas trees. Locally grown, freshly cut, ready to decorate. This year, treat yourself to the real feel of Christmas.